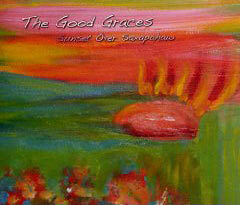 Sunset over Saxapahaw Is the debut album from Atlanta's The Good Graces, who are really the brainchild of Kim Ware, the founder of Eskimo Kiss Records. Ware also has played around town a fair amount, primarily as a drummer, so an album on which she both plays guitars and sings would seem to be a bit of a departure. Likewise, as a drummer, the music with which I associate Ware is usually upbeat and driven, so that having a record which I've seen described as "folksy" would also seem to be a little out of the norm. Still, I have to admit that taken on its own, and without any preconceived notions, Sunset over Saxapahaw is a solid little record. Most of the folks who I've talked about with this album have, as I mentioned, called it singer-songwriter; they've also used the adjective "minimal" in describing the sound. For me, calling something minimalist singer-songwriter brings all sorts of things to mind, and not many of them are good. And, after the first listen, I sort of get where people are coming from. Yes, the primary focal point of the record is Ware's earnest songs and vocals, just like any number of singing-songwriting acts. Yes, the record feels light, with ample empty space loosening up the music. But at the same time, the musical styles and the performances themselves bounce around enough that they don't have the claustrophobically intense feel that so characterizes the singer-songwriter genre. As an example, some of the best tracks on the album have a nice jangly feel, as if some mid 90s indie pop band had stripped down their instrumentation without sacrificing any of their energy. For instance, the second track You and Me and Our Ghost includes not only a briskly strummed acoustic guitar, but also some thuddingily echoed light drums and a pretty keyboard line that mimics the chord progression. The quick pace, and Ware's emphatic vocals, gives the song a little extra oomph that lifts it above the norm. Likewise, Stuck Inside has a similar brisk beat which is enhanced by some fast keyboard notes and a bouncing (and intricate sounding) bass line, while the rather short Who We Are adds some backing handclaps and foot stomps to propel the music forward. However, the faster songs aren't the only good thing about the record. Opening track Promises I Can't Keep consists of Ware's voice over a gently plucked guitar. It's clearly a minimal track, but at the same time, the vagaries of the tone and sound of the guitar gives the song a little more variety than you would expect. Similarly, on What's Wrong the interplay between Ware's acoustic guitar and backing musician John McNicholas's simple yet pretty electric guitar melody give the song a slightly dreamy and melancholy air. Finally, a harmonica sets the gentle (but angry-sounding) Disassembled apart, with its emphatic notes highlighting the guitar and Ware's voice, so that the spirit of Fontaine Toups (from Versus, circa Wind Me Up) is invoked. In the end, I understand why some people want to call Sunset over Saxapahaw minimal. Admittedly, it's minimal in a singer-songwriter sense. However, The Good Graces have produced what is essentially an indie rock record, and in this context, the recording is minimal indeed. Nevertheless, as I mentioned, it's a really solid performance, with lovely melodies, which truly makes for a nice record overall.